Apparently the crown wheel and pinion in a Jag diff are identical to the American Dana 44. There are more splines for the flange, and the bolts holding the crown wheel to the carrier have a different size. These differences can be solved. Has anyone tried fitting an American Dana 44 CWP to a Jag diff? Any problem? Off course they deny any responsibility, the diff rebuilt only cost me 2000£. I did all the rest. Apparently getting good gears becomes a problem, and I'm really fed up with these "specialists"
I can do Jag engines, my dad can do Astons etc...engines so we should manage a diff! I decided to do it myself, so advices welcome please!!! By coincidence, I've just had our IRS overhauled. 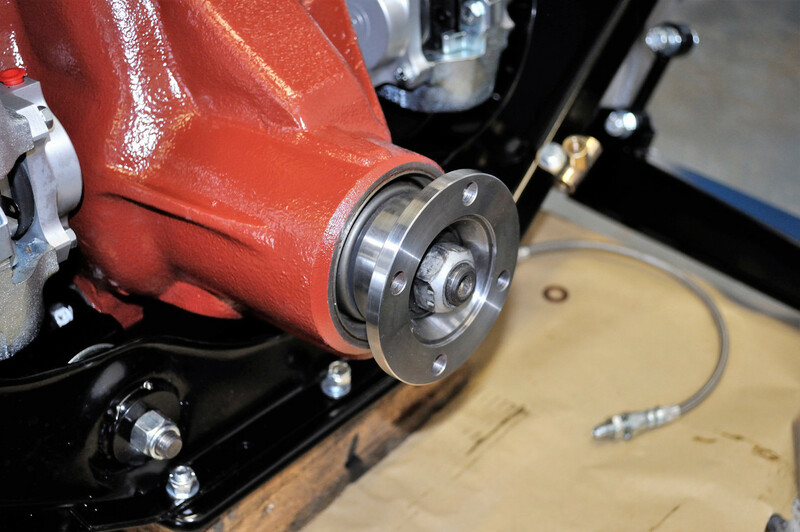 The diff had been converted to 3.07 in the USA back in the mid 1990s and, on opening the diff up for the seals to be done, we noted it was a Dana 44 crownwheel/pinion (with a 26 spline shaft). The car had done only 10,000 miles since that time but there was no sign of wear. It was also very quiet (which we were keen not to undo). @ PhilK : Are you not a friend of Steve (Southern Classics in Twickenham) ? Yesterday I asked him about that subject and he told me a story very similar to yours. He may well have been referring to my car (which Southern Classics has just done an IRS overhaul on). The firm he used to refurbish the differential noted it had a Dana Crownwheel and Pinion (which meant it had a 26 Spline Yoke at the end of the Crownwheel shaft). Given the diff was running so quietly and the 3.07 Crown Wheel and Pinion were virtually unworn, we decided to leave it in-situ and just replace the seals. Steve then managed to source a superb 26 spline Flange of the correct size and hole spacing. See picture below. Using Dana 44 3.07:1 parts is the way I am going. The rear suspension is still in the car but I was lucky enough to source a new Spicer gear set from Amazon (before the Aus version took over here!) for about $150. Instead of shoulder bolts I have hardened spacers to fit over the 3/8 Dana bolts which are narrower than the 7/16 carrier holes. I sourced a 26 spline input flange from Northern Drivetrain for just over $100. I compared bearing part numbers and sizes with the various data available online and I think the bearings in the kit should mostly fit OK. My local specialist will put it all together and says he can source anything needed including an input shaft spacer/ crush sleeve/ bearings if needed. Cost will be about $1500 for the change, so all up should be under $2000 (about gbp 1400). Some Spicer part numbers are CWP kit (706017-X) input flange (2-1-1881-X or NDT00113) bearings (706031X & 706030X) seal (CR15788). I hope that helps. Thank you all for the messages, even if I'm still not sure 100% it helps. Just talking to someone I recently learned that there are 4 types of input shaft bearings! !